Starting back in 2008, Ford Motor Company has produced a unique, aircraft-themed vehicle to be auctioned off for the Young Eagles charity at the annual EAA AirVenture Oshkosh, Wisconsin. In the previous ten years, the company has donated nine custom Mustangs and a custom F-150 Raptor, all of which have worked together to raise more than $3,000,000 for the group. These vehicles feature a custom exterior and a long list of performance upgrades, so in addition to helping a good cause, the bidders are competing for a one-of-a-kind, high performance car or truck. For the 2018 EAA AirVenture event, Ford Performance has teamed up with Vaughn Gittin Jr and his brand RTR Vehicles to create the most unique and highest performance aircraft-themed charity car yet and it is named the Eagle Squadron Mustang GT. 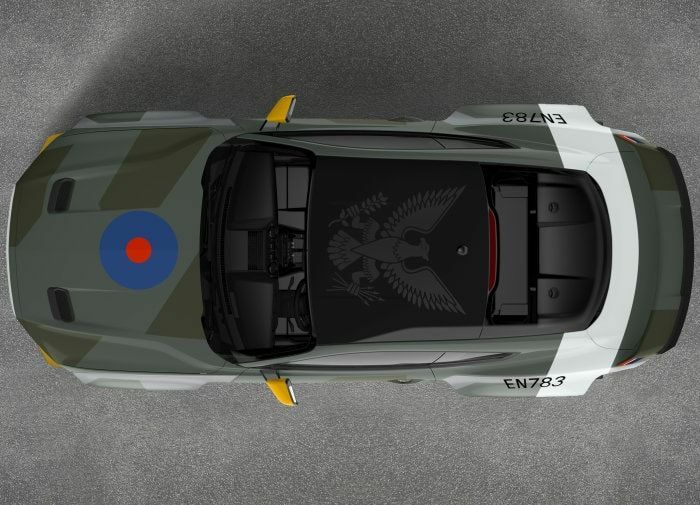 On the outside, the Eagle Squadron Mustang GT has a carbon fiber widebody kit from RTR Vehicles with an eye-catching livery that pays tribute to the American fighter pilots who served in the Royal Air Force during World War II. We only have the one picture shown above right now, but we can bet that this muscle car looks like a fighter plane from every angle. To help this pony fly, Ford installed a supercharger package that lifts the engine output to 700 horsepower while a suspension package from Tactical Performance improves handling while also giving the car a menacing stance. There are no details on the interior or the rest of the car, but if I had to guess, I expect that this car has some custom wheels with high performance tires, a set of high performance brakes and at least some interior upgrades. Finally, in addition to getting this cool Mustang GT, the winner of the charity auction also gets an all-expenses paid trip for two to the 2018 Woodward Dream Cruise in Detroit, where the car will be presented. Since this car is built to honor American soldiers supporting Great Britain in World War II, drift champ Vaughn Gittin Jr will debut the car at the Goodwood Hill Climb on July 12th. Goodwood draws some of the most incredible performance cars in the world, with well-known drivers working to see how quickly they can cover Lord March’s driveway. The Eagle Squadron Mustang GT will fit right in amongst the other high performance machines before heading to Detroit for its delivery to the new owner. 2015 – Apollo Edition Mustang paid homage to the Apollo spaceflight program, which delivered astonishing innovations in technology and landed the first human on the moon.